On behalf of the LORI Resource Sharing Working Group (RSWG), Karen and Zach invite school library staff to complete this brief copyright and fair use survey to let us know the questions and concerns that apply to you. Survey results will be used to formulate ideas for future RSWG programming. Survey submissions are anonymous. Deadline for submissions is 5 PM on Friday, April 5. Missed, but still interested in the March 20 webinar on Digital Collection Development? You can view a recording of the webinar at https://home.edweb.net/webinar/emergingtech20190320/. RILINK needs a host site for a May inventory workshop. The librarian of the host site has the benefit of having the inventory process set up while Dorothy provides the "how-tos" for the participants. Please contact Sharon if you would like your library considered. RILINK members can take advantage of a free Infobase trial running from now through June 9th. An email with the trial information was sent to the RILINK list on March 27th. and many others. Share the trial with your teachers, including Mailbox School - fun and engaging ideas, activities, and worksheets with teacher-created ideas that work. Please note that Infobase will not increase the pricing on all renewals for the next three years. You can find the list of the 69 BookLynx titles, both eBooks and audiobooks, added or renewed for March at https://bit.ly/marchbooklynx. Instructions for adding BookLynx eBooks and digital audiobooks to your library’s FollettShelf are on our web site at http://guides.rilink.org/shelf on the [Add/Delete Titles?] tab. You may need to refresh/reload the page to see the current set of instructions. If you need barcode labels, please complete the order form at http://guides.rilink.org/beyond_help/orderlabels . The deadline for submitting orders is April 19th. If you have questions, please contact Dorothy Frechette. Happy Poetry Month! Check out Shannon McClintock Miller's The Library Voice Blog and her "Poetry, Poetry, Poetry Collection" for resources. "High school students from across Rhode Island have voted! We're proud to announce The Hate U Give by Angie Thomas as the winner of the 2019 Rhode Island Teen Book Award. Our Honor Books are Long Way Down by Jason Reynolds and The 57 Bus by Dashka Slater." All of the titles for the 2020 nominees for both lists are now available in RILINK Schools Assets as Book from Catalog. Two very simple sample pages have been created on the Webster High School demo site. Please feel free to reuse the boxes or pages. Make sure you copy the box or page so you can edit it to fit the needs of your school. As soon as the titles for RIMSBA are available, they will be added along with a sample page. Register now to reserve your spot for the April 24th session. 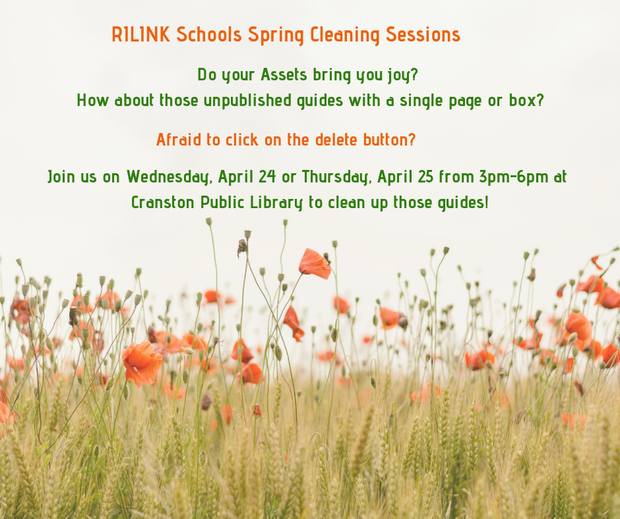 Register now to reserve your "spring cleaning" spot for the April 25th session. Looking for time to work on your new site? A limited number of spaces are available during the Spring Cleanup Session. Indicate your interest on the Registration Form or contact Sharon to reserve a spot. Are you using your library website for evaluation or to meet professional development goals? Take a look at Statistics found on the orange command bar. Watch this short screencast to learn more about this tool in Springshare Help. If prompted to login use your RILINK Schools username and password. Has a box like the one above appeared when you have tried to add widget code to your site?When embedding code from a third party source (such as Infobase), please be cautious. If you do not know how to fix the html code, do not add it. 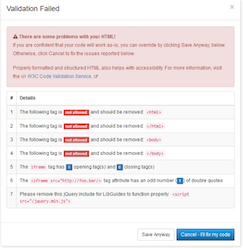 Adding code not compatible (such as jQuery) or incomplete in some way has consequences. Contact us for assistance. Please take a moment to review this FAQ at https://ask.springshare.com/libguides/faq/939. Congratulations to the following school libraries for successfully completing the process and becoming Resource Sharing libraries for the first time! The benefits of LORI membership include resource sharing with RILINK/LORI schools and the entire Ocean State Libraries network. It is also possible to borrow from academic and out-of-state libraries. The ability to provide needed materials to your students, staff, teachers and administrators is one of the ways school libraries are seen as essential partners in creating lifelong learners. 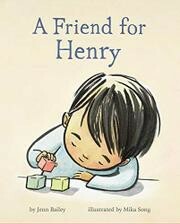 A Friend for Henry is the story of a boy on the autism spectrum who struggles (at first) to make a friend at school. This sweetly told and beautifully illustrated tale is author Jenn Bailey's first children's book. Full disclosure: Zach and Jenn went to Toll Gate High School together. Read a review of this picture book Kirkus Reviews and learn more about the author at https://jennbailey.com/. 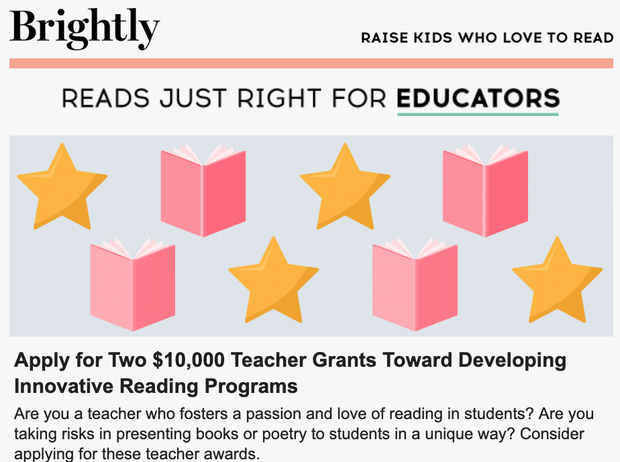 Learn more about this grant opportunity at http://bit.ly/brightlygrant.